In the foreground sits a brindled ox with its left horn trained to grow across its muzzle, a deformation called ma gut. This was carried out by initiated youths on their favourite beast for aesthetically pleasing effect. 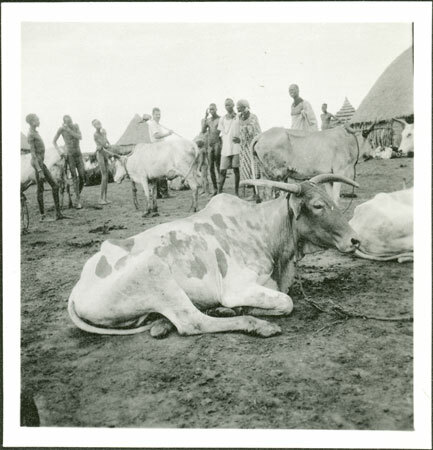 In the background a European man (possibly the administrator Frank Corfield) is holding an instrument of some sort towards a tethered cow with long horns. To the right of the gathered Nuer can be seen a man wearing a body cloth and black neck ornament, bearing a strong resemblance to the youth wearing shorts at a cattle camp in Plate VIIb of The Nuer, described as Lou country. Note on print reverse ms pencil - "78 2 298"
Morton, Chris. "Nuer ox" Southern Sudan Project (in development). 03 Jan. 2006. Pitt Rivers Museum. <http://southernsudan.prm.ox.ac.uk/details/1998.355.381.2/>.